This is the first peer-reviewed manuscript from this project. 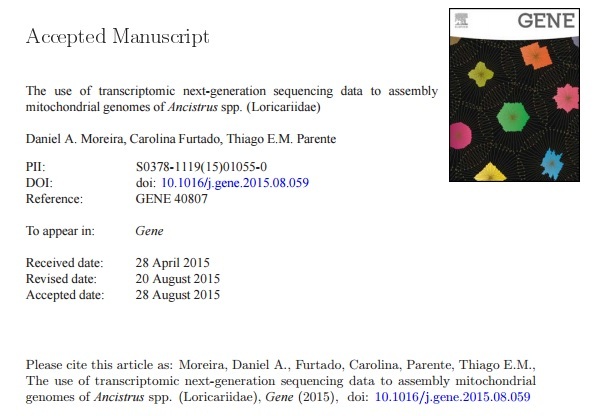 It is entitled: "The use of transcriptomic next-generation sequencing data to assembly mitochondrial genomes of Ancistrus spp. (Loricariidae)". It was produced with great effort and love. Hope you enjoy. Mitochondrial genes and genomes have long been applied in phylogenetics. Current protocols to sequence mitochondrial genomes rely almost exclusively on long range PCR or on the direct sequencing. While long range PCR includes unnecessary biases, the purification of mtDNA for direct sequencing is not straightforward. We used total RNA extracted from liver and Illumina HiSeq technology to sequence mitochondrial transcripts from three fish (Ancistrus spp.) and assemble their mitogenomes. Based on the mtDNA sequence of a close related species, we estimate to have sequenced 92%, 95% and 99% of the mitogenomes. Taken the sequences together, we sequenced all the 13 proteincoding genes, two ribosomal RNAs, 22 tRNAs and the D-loop known in vertebrate mitogenomes. The use of transcriptomic data allowed the observation of the punctuation pattern of mtRNA maturation, to analyze the transcriptional profile, and to detect heteroplasmic sites. The assembly of mtDNA from transcriptomic data is complementary to other approaches and overcomes some limitations of traditional strategies for sequencing mitogenomes. Moreover, this approach is faster than traditional methods and allow a clear identification of genes, in particular for tRNAs and rRNAs.